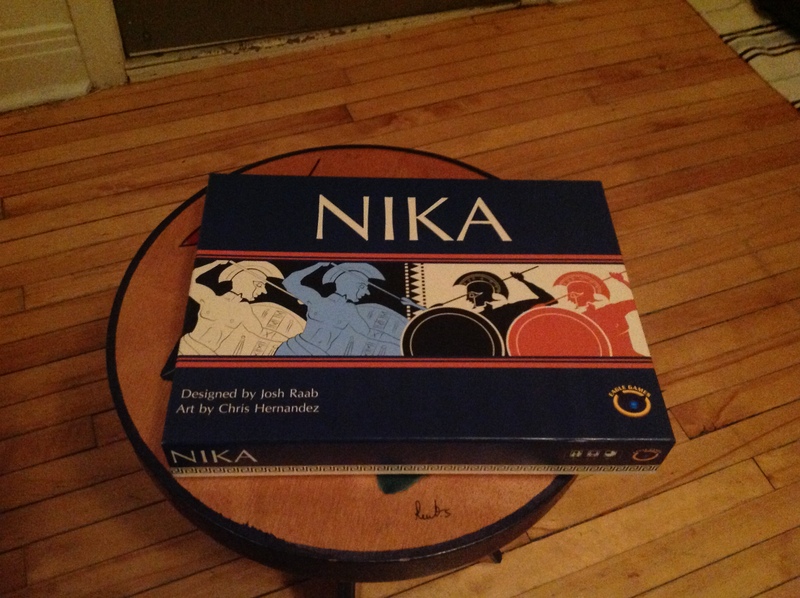 Today I received my advance sample copy of Nika! It’s an amazing feeling, having my name on that box. The components are all lovely, and I’m grateful to Eagle Games for doing such a good job on them. I’m also looking forward to finally having a copy of the game that actually fits in a backpack, instead of having to carry it under my arm like I’ve been doing for the past few years. Lesson learned: convenience of storage and transportation is a factor when prototyping. I’ll be showing the game off to as many people as I can find to play it in Montreal this summer. I’ll most likely be leaving this copy at Concordia University’s TAG Lab as thanks for hosting me at Critical Hit. – Still is a meditative game inspired by memories of childhood and my love for walking around vast public spaces at night when no one else is around. Starting in a forest and moving into a city, the player may choose to explore and seek out bits of written narrative. The game plays with perception, with its three sections evoking feelings of being first lost, then awed, and finally trapped. I created Still along with Li Zhi He and Winnie Song. – Welcome, Inspector is more or less a digitally aided role-playing game for five players. Set in a (technically) fictional capitalist dystopia, four players are brought into the Bureau for Economic Assessment and Rehabilitation (B.E.A.R.) for questioning by the fifth player. Without spoiling too much, let’s just say it involves headphones and a program called the “Sonic Isolator”. The team included myself, Pierre Depaz, Andrew Goudreau, Li Zhi He, and Tuuli Saarinen. – Spacebro Justice Rocket! is a rhythm combat game controlled by the High-5000, a custom-built controller that uses pressure plates and an Arduino to detect high fives, fist pounds, and elbow bumps. What more could you want? I worked on this with Anh Chi Bui, Nick Kornek, and Louis Sciannamblo. Special shout-out to Nick for assembling the High-5000. The Critical Hit site has loads of great documentation, including interviews, game summaries, a blog, and tons of fantastic photos. The other games from the program have been as cool as mine if not cooler, so go check it out!